Tech O Blog : OneDrive is out ! Microsoft has released their updated cloud storage service namely OneDrive. OneDrive is the new name which is replacing SkyDrive. 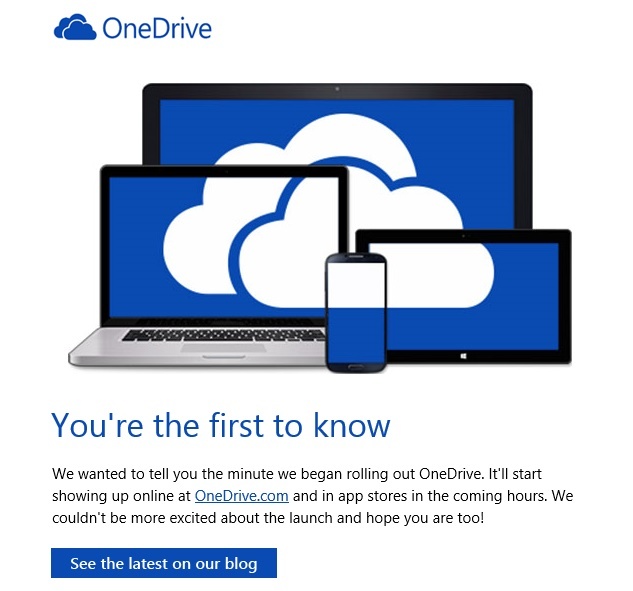 You can learn more about OneDrive in this preview website. "Today we are thrilled to announce the global availability of OneDrive. For our existing SkyDrive customers, you are all set; your files are ready in the new OneDrive experience. All you have to do is head over to www.OneDrive.com and log in. For those of you hearing about the service for the first time, OneDrive gives you one place for all of your files, including photos, videos, and documents, and it’s available across the devices you use every day." reads the official blog post. Still the storage plan remains the same for the free users but there are new ways to get more storage for free. You can also buy storage which starts from $25 for 50GB/year through $100 for 200GB/year. You can have a look at the storage plans from here. OneDrive currently SkyDrive is built inside Windows 8.1 and will receive the updated version of the app soon. If you are using other operating systems then you can download the new app from here.SkyDrive will be completely replaced by OneDrive within hours. So what do you think about the new name ? Yeah ! :).. Did u grab the 100 GB Offer ? No i didn't. Did u grab that offer ?